Did your Rockwell tester show up? Looking good Carter! I'm a big fan of W2 tool steel and as far as reactive, about the least reactive of anything carbon I have ever used. Thanks Ray, I have a feeling the W2 blades may become more popular than 52100. Matt - Yes, it did. Glad to have it, but getting some real confusing results with the testing....getting HRC #'s from mid-30's to upper 50's. The test blocks are reading with reasonable accuracy, but the blades and coupons I have tested are off. I have reached out to Bloodroot for advice, they have the same machine. I made a coupon of W2 yesterday and just hardened it, no temper....it should be 65+ HRC, but getting a low reading...files skate off of it and a fresh ceramic belt was having trouble cutting, so it is hard. Jeff - I am finding it to be less reactive than 52100. It will patina quickly, but seems to better with ingredients and doesn't get too funky smelling like some of the other steels, including 52100 sometimes. 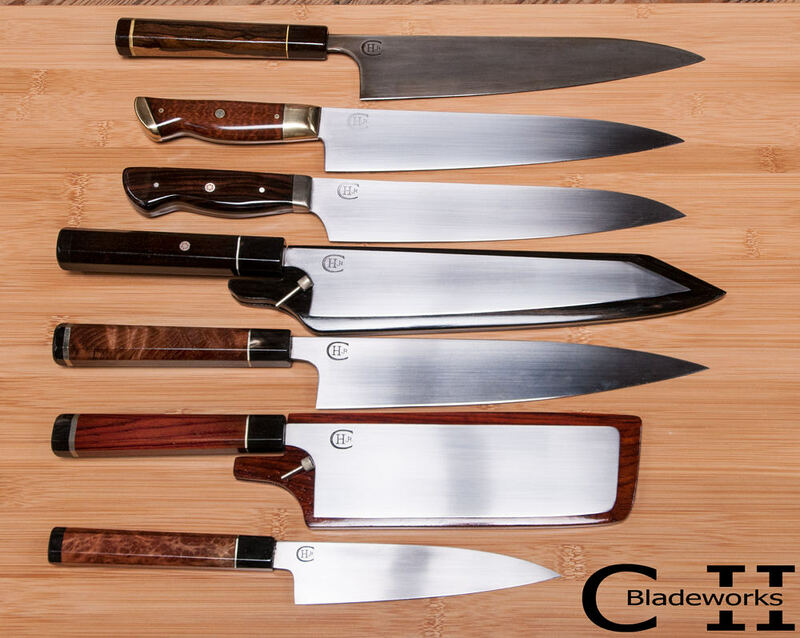 I am still learning about the claying and hamon process, but is has become clear that the W2 blades will be more $$ than 52100 due to increased time. 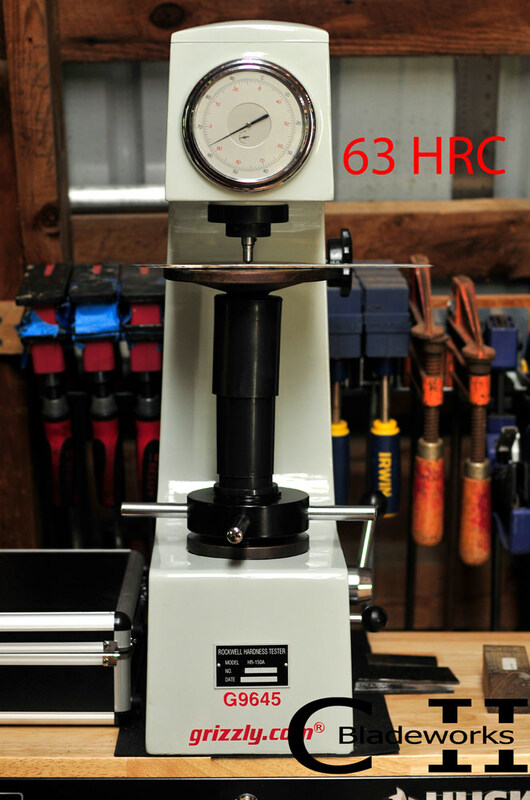 For no differential hardening and not as high a polish (required to show hamon) prices should be similar to 52100. 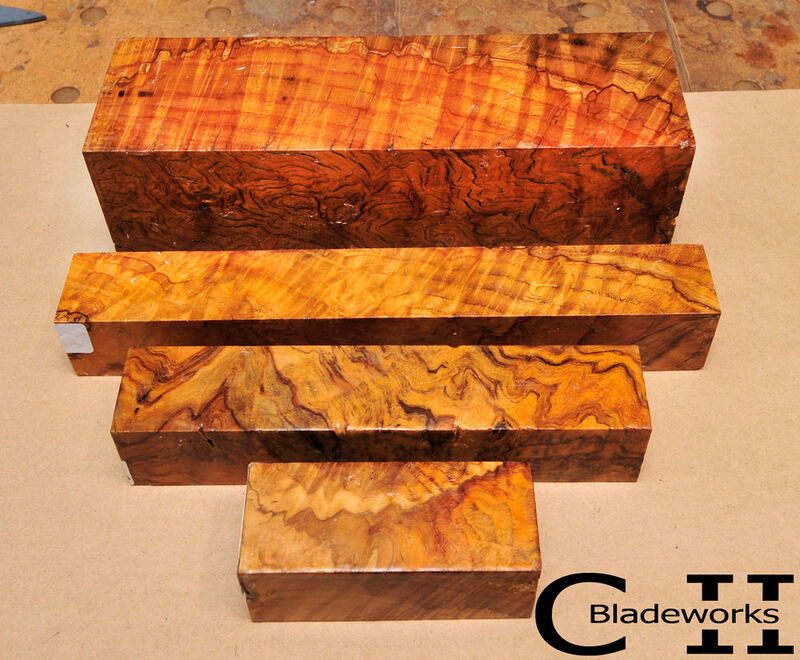 Question: At some point, I would like to try forging blades, it won't happen soon, but maybe within the next year. I imagine the prices of the forged blade will be more $$ due to more time involved in creating the blade vs stock removal. The question is, is a forged blade worth more than stock removal, even if heat treat and end performance is exactly the same. In a blind testing could you tell the difference??? These are the questions I ask myself....would appreciate your input. This is a 185mm petty in W2 carbon steel. It has been clayed for differential hardening and is about to go in the oven at 1460F for heat treating. Testing a W2 Nakiri this morning....indicating 63 HRC....pleased with the result. 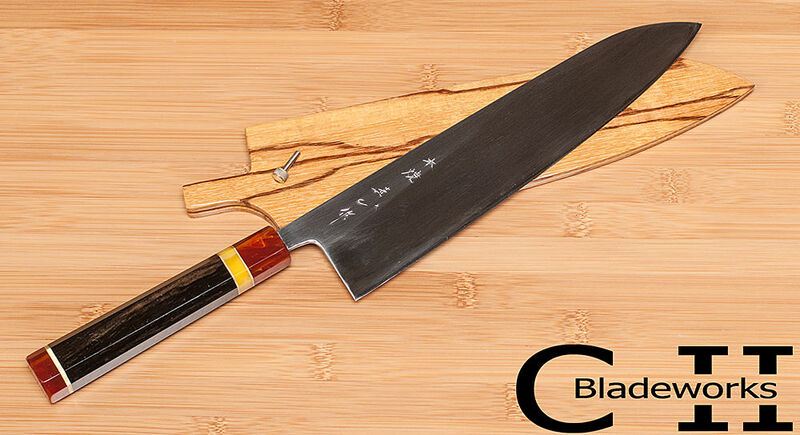 Here is a 265mm gyuto made of 52100...it has been heat treated to 61 HRC and is ready to go to work....PM me if interested. Just got a shipment of Dyer Oak in...it is from Oregon and is a rare wood....can do handles and matching sayas. Again, PM if interested. This is a 185mm petty in W2 steel. It has only been polished to a low level and then etched to reveal the hamon. I did not polish all the etchant off, the gun metal finish really shows the hamon. What are your thoughts about this type of finish vs a higher polish and a more traditional looking shiny blade? FYI...this handle is for another knife, I just banged it on for the photo. I think the way you've got this is spot on. Like you said this brings out the hamon really well. If it was a higher polish it wouldn't be so much contrast. Love it Carter. And that handle is beautiful too. I think that looks really good Carter. What did you use as the etchant? I’ve been told that different enchants will bring about the ashi in various ways, but I haven’t been able to test that out yet. It’s still possible to get a high degree of hamon contrast on a highly polished knife, but it requires multiple rounds of etching and polishing. Both styles look great so I guess it boils down to personals preference. I use a diluted ferric chloride solution. It seems to work best with multiple etches and polishing off the carbides between each etching. I have played with vinegar before and also oiling the blade and then heating it a little, but that was with 52100. The 200mm W2 line knife I made has a pretty high level polish, not mirror, but maybe 1500 grit, that hamon stands out. This is an early 52100 gyuto that is etched....it is really a cool knife, not sure why it is still around. This is a 250mm Watanabe Honyaki gyuto that I just finished for one of our Forum members. The handle is gaboon ebony with a ferrule and endcap made of dark amber and a spacer of nickel-silver and light amber. The saya is marblewood with a hand turned and knurled nickel-silver pin. The customer envisioned the design and supplied the materials. I think this is a really neat combination. Very nice combo indeed. Good choices all round I think! 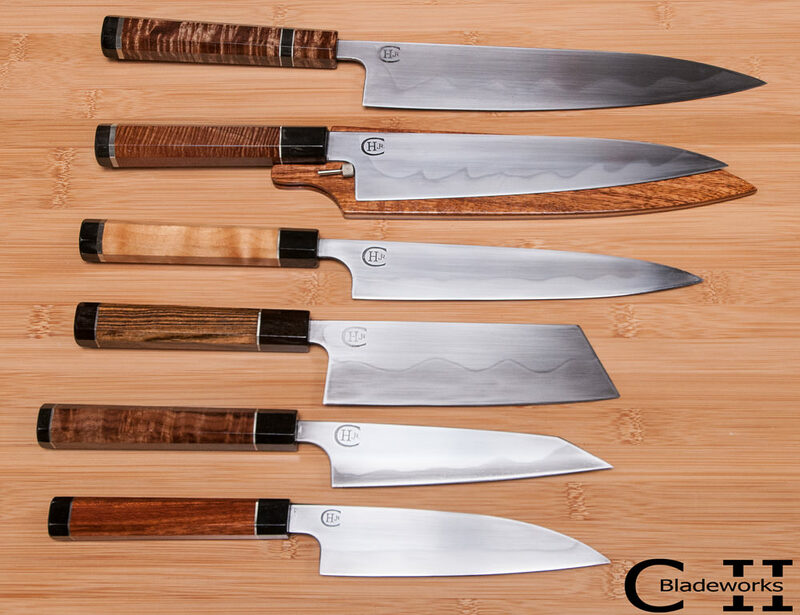 Here are the blades I am bringing to the Chicago knife show. Very nice Carter, looking forward to seeing them in person! Yes...yes they are. Love W2!